Other than that bump in displacement and power, the goal of the Aprilia RSV4 1100 Factory remains, to quote the press materials, the same as with its previous generations: “[T]o be the absolute best and fastest uncompromising superbike, the one that comes the closest to Aprilia racing bikes in terms of performance and effectiveness.” So, you shouldn’t be surprised to learn that the chassis was also massaged. From the new, slightly shorter wheelbase to the new Öhlins suspenders (front and rear) that are dynamically monitored by Aprilia Performance Ride Control, the Factory is ready to rail through corners. 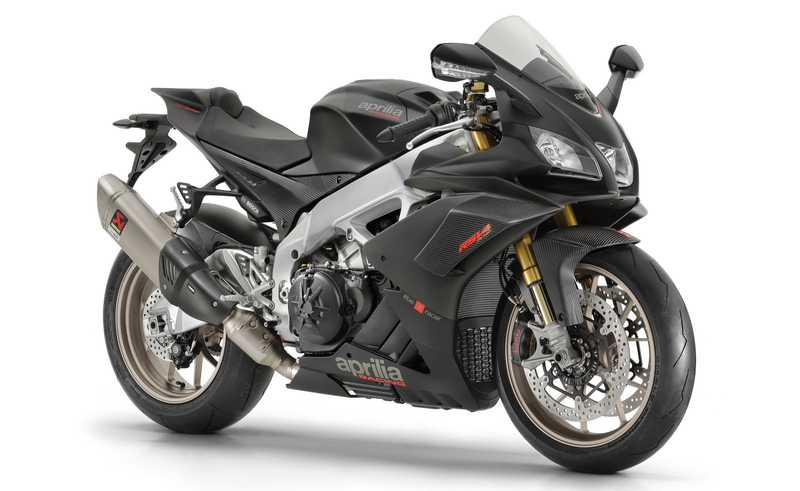 Take a look at Aprilia’s press release to learn all about the RSV4 1100 Factory. Recording the items on the 2019 BMW S1000RR that went unchanged from the previous model would be an extremely short list. So, we’ll start with the engine, which has been completely redone. The big change is the company’s ShiftCam variable valve timing technology, which, thanks to the the two cam profiles provided to each intake cam, increases torque at low and medium rpm without robbing the top end power. 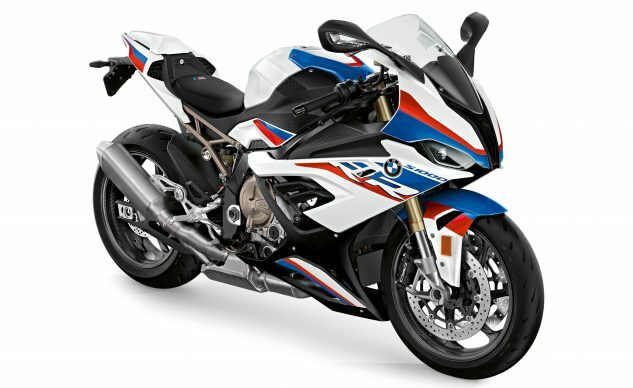 The S1000RR’s frame is a new aluminum unit that is both lighter and increases the engine’s role as a load-bearing unit. The geometry numbers were tweaked, while dynamic suspension is available as an option. 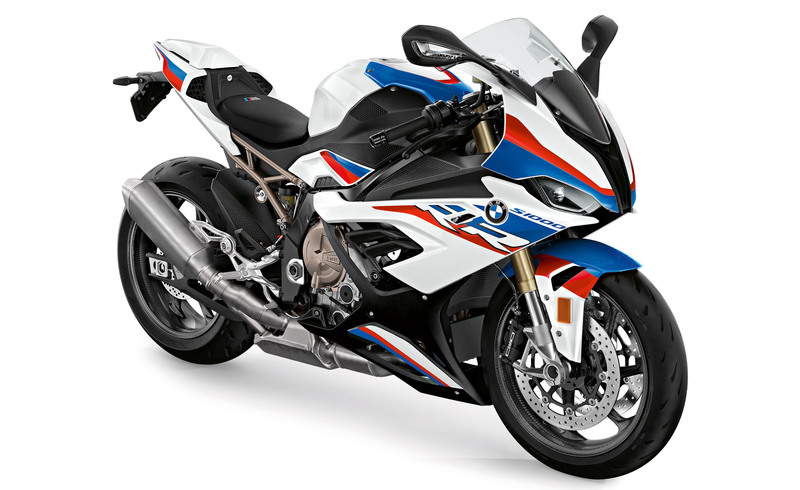 Read all about the 2019 BMW S1000RR here. After stunning the world with the Panigale V4 S (and winning the MO Best Sportbike Of 2018 and the coveted MO 2018 Motorcycle Of The Year ), Ducati needed to turn its V4 attentions to the 1000cc racing market. 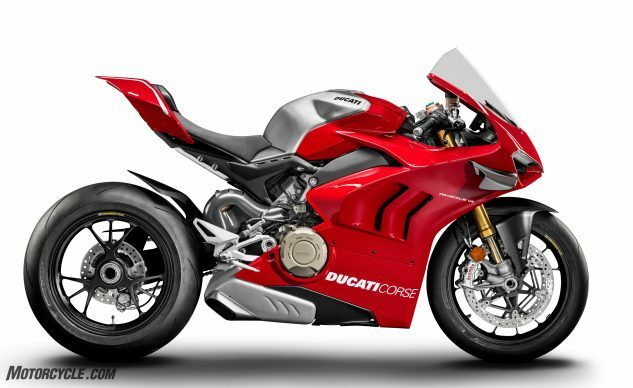 For 2019, the Ducati Panigale V4 R enters the fray with a WSBK-legal displacement 998 cc Desmosedici Stradale R engine and a claimed 221 hp! Everything about the V4 R is focused on being a street legal track weapon. The chassis has had its stiffness tuned to Ducati Corse specifications and uses the engine as a stressed member. Top shelf Öhlins suspension units grace both ends of the bike. Braking is handled by the current state-of-the-art Brembo Stylema monobloc calipers. Finally, the bodywork includes an aero package produced by Ducati Corse in conjunction with the Ducati Style Centre. Our first look article from EICMA has all the details. For 2019, we’re not getting one but two flat track-inspired Indians, the FTR1200 and the FTR1200 S. These 1203cc V-Twin-powered bikes should scratch the itch of anyone looking for a street tracker. Ducati Monster comparisons aside, the 19- and 18-inch wheels give the FTRs a look that should warm the heart of any flat track fan – particularly when paired with the super cool Dunlop tires. The differences between the two models are largely that of bells and whistles, with the S benefitting from the upgrades. The S’ suspension is fully adjustable front and rear. The electronics package grows to include: a 4.3-inch Ride Command Bluetooth-equipped LCD touch screen, lean-angle sensitive stability control, ABS, traction control, wheelie mitigation control – and three ride modes. 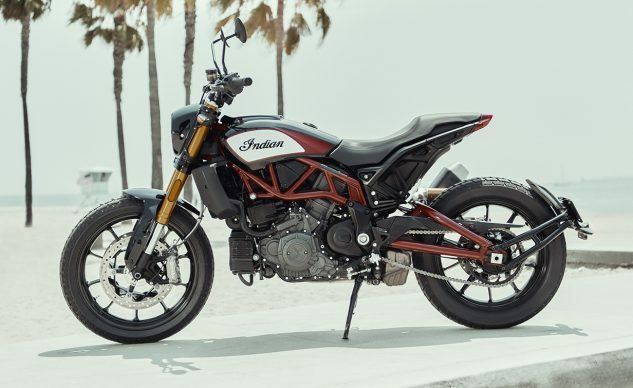 Read John Burns’ article with all the specifics about the 2019 Indian FTR1200 to learn more. 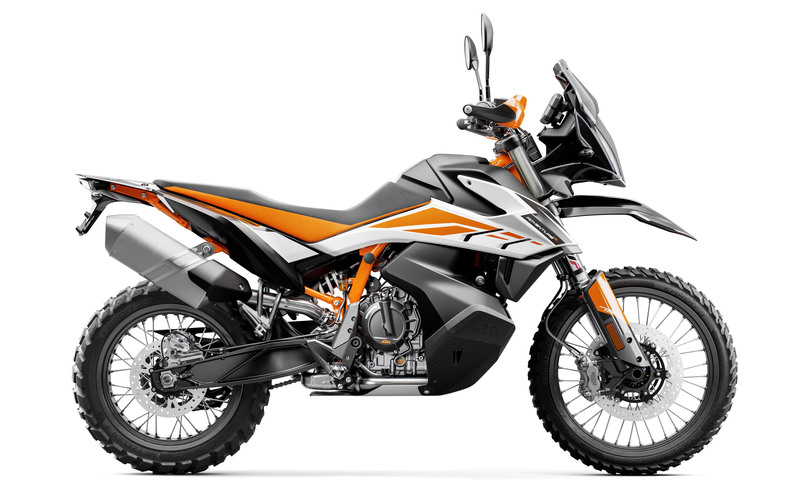 Continuing with the two models in the same line theme, we bring you the 2019 KTM 790 Adventure and 790 Adventure R. Fresh on the heels of the successful debut of the 790 Duke in the U.S., KTM is taking its LC8c parallel-Twin and wedging it into an adventure frame, prompting fans of adventure bikes to wonder if this is the middleweight entry in the class that we’ve been waiting for? The 799 cc parallel-Twin produces tons of torque in its street-going Duke trim. We can only imagine what a little retuning for the bottom end can deliver adventure riders. Additionally, the U-shaped tank helps keep the CG low for dirt manageability. Not surprisingly, the frame is of a trellis design. The R model offers a taller 34.6-inch seat height (versus an adjustable 32.7 to 33.5 inches on the standard). Get the full skinny on the two 2019 KTM 790 Adventures here. What do we have in the Moto Guzzi V85 TT? For starters, the TT stands for “tutto terreno,” meaning all terrain. 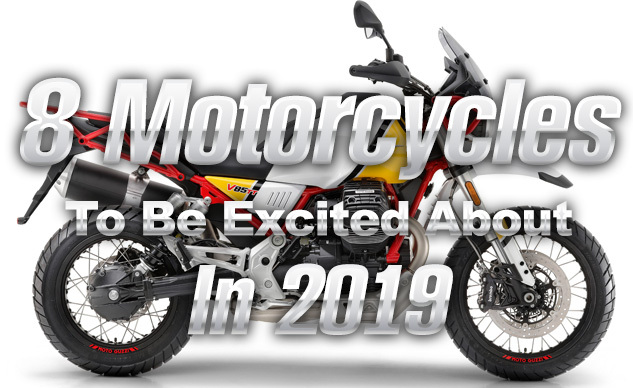 Add into that a new 853cc air-cooled 90-degree, two valve per cylinder, air-cooled engine, and Moto Guzzi fans – and adventure bike fans, to boot – have a reason to be excited. With 90% of its claimed 59 lb-ft peak torque available at just 3,750 rpm, the V85 TT should have the chops for crawling along over technical terrain. The rest of the chassis fits the bill, too. The suspension has 6.7 inches of travel, front and rear. The spoked wheels are 19-inches front and 17-inches rear. Brembo calipers handle braking chores. In the end, it’s all about the new engine, which is the only shaft driven one in its class. We can’t wait to see what other models our friends in Mandello del Lario have up their sleeves. 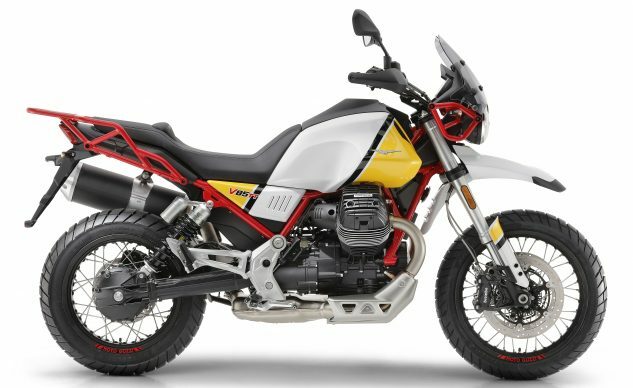 Read the extensive information Moto Guzzi provided us to learn more. So, what do you get for the as yet undisclosed number of greenbacks? Aside from the beefy engine, the Brutale uses a “composite chassis structure,” which mates a steel trellis frame with aluminum side plates, attached to Öhlins suspenders at both ends. Braking is handled by 320mm floating discs with Brembo Stylema calipers. Naturally, carbon fiber plays a big role in keeping weight down, but this isn’t your typical carbon fiber. Instead, the fiber weave has red anodized copper wires included in the mesh to deliver an eye-catching dose of color to the ultra-light parts. 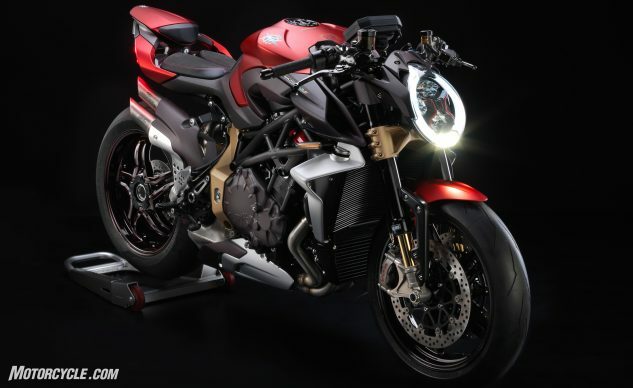 There’s more information about the limited edition of 300 units 2019 MV Agusta Brutale 1000 Serie Oro here. At long last, our wait is finally over! After months seemingly years of videos and press releases about the Yamaha Ténéré 700, we’re finally going to see it in production! 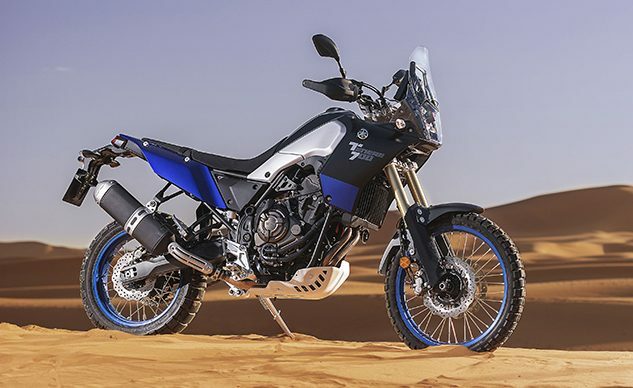 The Ténéré is powered by the CP2 689cc parallel-Twin engine, similar to the one used on the MT-07 and XSR700. So, it should be a blast to ride. We are particularly stoked at how this middleweight adventure class is bulking up and can’t wait to bring this much anticipated bike plus all the other new competitors to the MO proving grounds to see how this class compares.